Jumping off French cliffs may entail thoughts of having been pushed, but this festival ensures you’ll love every minute of it. 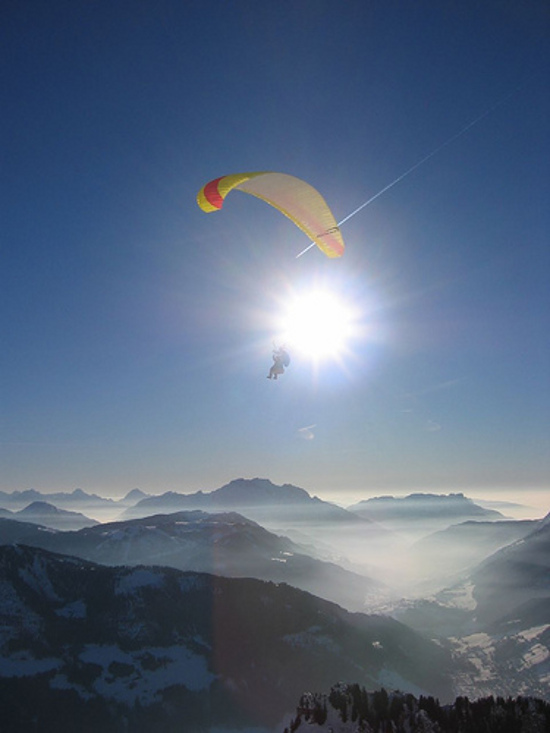 Pavla Tolonen explores the elements of paragliding. Like something directly out of a Michel Gondry music video, the 2009 Icarus Cup Free-Flying Festival brings together all the weird and wonderful aspects of someone jumping off a cliff. Combining eight elements in one, the event, which is held in Saint-Hilaire in the south-west of France, features an International Free Flight film festival, an air sports trade fair, aerial demonstration, “Masquerade” flights, a costume flight competition, hot air balloons and kites. Although the main attraction is obviously the costume-clad flying dare-devils, who sometimes invest vast amounts of time and energy building their fleet, yet fail to lift off because of it being too large, the festival celebrates all types of flying-related activities. It strays from conventional festival tradition in that all events are massive events in themselves, as the Icare Expo and Icarnaval prove by being entirely focused on niche markets. While the Icare Expo is an air sports trade fair which focuses on free flight professionals, the Icare Show specialises in glider aerobatics, and the Icarnaval hosts the famous costume contest. Previous entries into the costume contest include a sinking Titanic ship, miners, a Concorde plane, Pirates of the Caribbean and an overgrown bush. Despite the Greek myth telling the tale of Icarus who used wings made of feathers and wax to escape his island prison on Crete, the event has yet to host a similar character although it honours his memory. Around 8000 aviators enter the contest each year, leaping off the Plateau des Petites Roches, gliding down 600 metres to Lumbin. The Icare Momes is an especially designated area for younger visitors boasting a paper plane contest, a bungy trampoline, a gyroscope, falconry demonstrations and the construction of identified flying objects. Early in the week the event also hosts a paper hot air balloon show. The film festival welcomes any plane-related movie submissions ranging from fiction to documentaries, as well as, clips or short features relating to flying, wind, air or similar floating air-borne subjects. Music, street shows and animation will also be displayed at the event, in addition to ultra-light, kite and helicopter demos. The event organisers also offer a glide ratio contest and free flight museum museum collection.